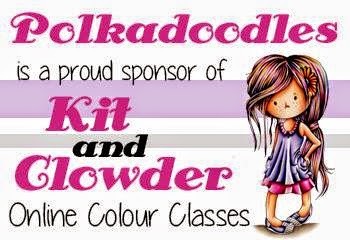 Happy Friday everyone and welcome to another week at Polkadoodles where it is my turn (Brenda) to host the challenge again. 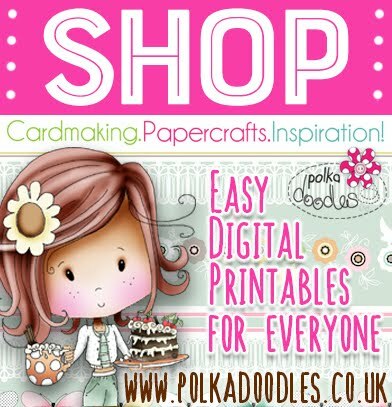 But before I talk about that, we have to remind all you avid Doodlers that you need to make sure you tune into Ideal World/Create and Craft this Sunday 27th June at 2pm to see the boss, the oh so talented Nikky launch her brand new CD, Paper Boutique vol II - Creative Christmas. The lucky DT have been having an advanced play with the CD to create samples for the show and I can tell you it's fabulous, one you won't want to miss. You can also get your mitts on the CD by pre-ordering and having a sneaky peek at what it's all about here - this will be the only CD you need to buy for Christmas this year! Make sure you snaffle the remote control from the OH and tune in for a craft fix before the England kickoff !! So a card or anything else you would like to create which you think would appeal to a lad, I am really looking forward to seeing your creations. And of course the DT have come up with some fab projects as usual to get your creative juices flowing. Brenda - I used the Paper Boutique CD, printed out a few extra stars, added some eyelets and fibres to the spine and stickles to the stars. This one is for our daughter to give our Grandson. Kerry - I went back to one our first CD's for my card this week - Candy Doodles. I love the little planes, trucks and cars that are in the boys section of the CD and did some paper piecing with them. 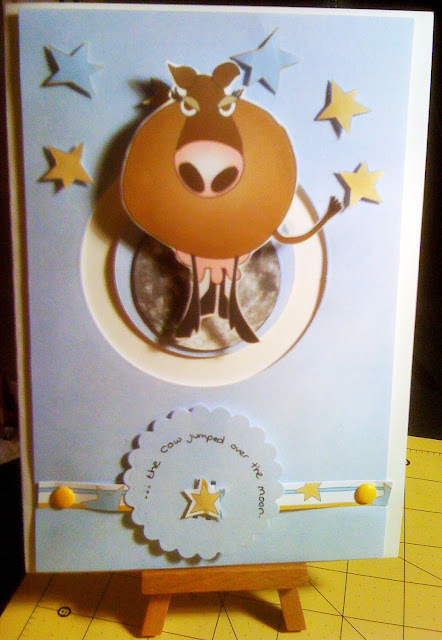 I've made the card for a friends son who is 2 in August. Tracy I used the All Around and Everywhere CD for everything apart from the Scooter which is from the Not For Girls CD Rom. Lisa - I used the All Around and Everywhere CD for the background, the cupcake and the sentiment. Those colorful banners always remind me of a fun celebration! Kris: I thought of a baby boy and used the star cake and backing paper from Paper Boutique Vol 1 along with a rub-on, some computer-generated words and stacked diecuts (numeral 2). 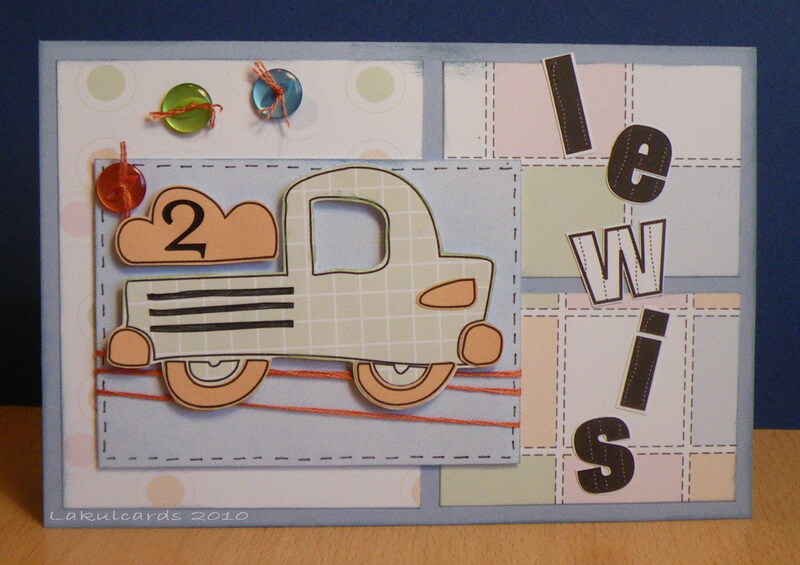 Jenny I couldn't resist using the cute little car stampie from Candy Doodles to make this card for a little lad. All of the papers and elements came from the Candy Doodles CD except for the frames which are on All Around and Everywhere. And the number 5 Alphie made a perfect little badge! Nettie: I have kept it quite simple this week. It's my nephew's birthday coming up and he is as the card reads, a ... Cheeky Monkey. I have cut out the funky monkey from the Paper Boutique CD and layered up both the front and back image. I have also used some printed acetate, so that you can see the image well. 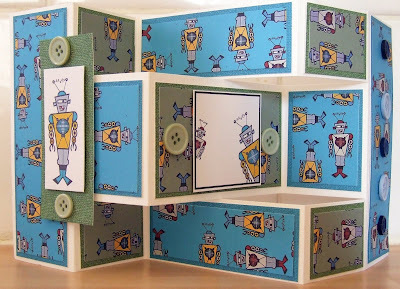 Tracie: I have used the "not so plain plains" and "retro robots" from Not for Girls to make a boy themed tri fold shutter card. Claire - Great minds think alike Tracie - I love those robots as well! I have gone for an easel fold with sonme added doodly wire. Ruth: I've also used the Son word card from Paper Boutique at A5. All the elements have been cut out and added to the card - this is a really nice and quick card to make. A bit of doodling around the edges with a black Sharpie marker and some glitter glue on the stars. 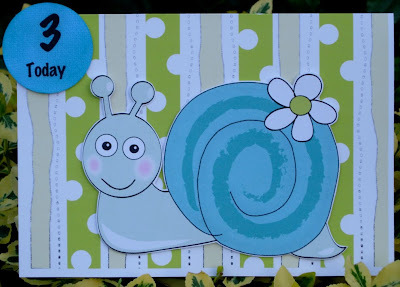 Fliss - I've made a very simple card with my great nephew in mind as he'll be 3 years old soon and I just know he'll love the cute snail from the All Around & Everywhere CD. I used backing paper from the Candy Doodles CD and printed my sentiment on one of the Not So Plain Plains from the Not For Girls CD. 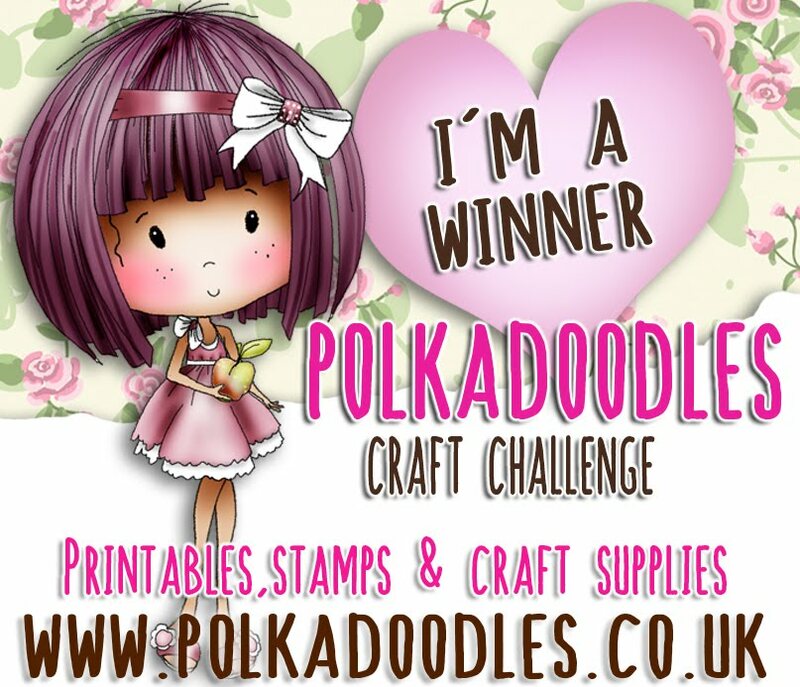 The deadline for entries is 12noon GMT on Sunday 4 July and please remember that a maximum of 10 challenges can be entered with your link including this Polkadoodle challenge. Well hello everyone it's Dee here and it's my first time to set a challenge and sort the blog post out. Something is bound to go wrong I just know it. Blogger and myself do not have an easy relationship so please be patient and gentle with me, lol ................. Now where did I put those Crunchies? It is Friday after all. The team have been busy and have come up with some fabulous creations for your inspiration, so have a little peruse below. Phew nearly there now, I've just got to let you all know the winners from week 22 challenge set by Lou which was Retro / Modern Anniversary. As always we were all impressed by all your wonderful creations. You don't make judging easy for us you know! Congratulations to you, please contact Nikky for more details and your all important blinkies!! Enfys - My papers are all printed from the Not For Girls (CD 2). I used the Queensbury Rules script for a backing, and cut three lots of boxing gloves out to decoupage them and add a bit of dimension. I covered them with glossy accents to make them shiny. 'Dad' was done with stickers, and the sentiment came from the CD. Lou: I have used papers and toppers from the "Not for Girls" CD to make this BIG card for my own Dad. I love these "rock star" images & have made my own chipboard stars (from thick card) covering them with the stars paper and music topper. I covered the card blank with the FAB "Father/Dad" sentiment paper . . . this comes in so many colours and loads of different male relatives too! Brenda - Well someone had to do it - I used the Not for Girls CD, printed the page out three times, cut out the footballs and decoupaged, England emblem from the Internet and squad names computer generated and punched into circles. 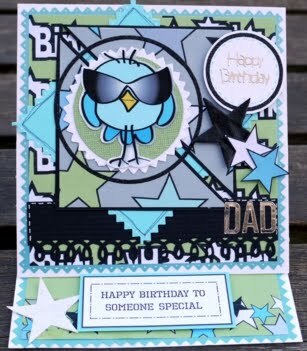 Claire - I love the cool dude birds on the Not For Girls CD and I have combined it with some fab papers from the CD and also the Christmas download bundle. He is Daddy Cool! Kris: Here's my take on this week's challenge. 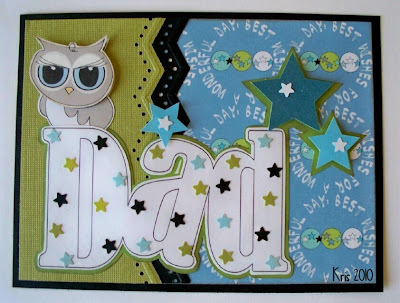 I used a backing paper from Not for Girls, the Dad template from Paper Boutique and cute little owl from Back to Nature. As I've said before, all of Nikky's fab collections can be used together so easily and I think this shows that. Jenny I've gone all Mod with my design this week! I've used the FAB scooter topper, target and brick wall papers from Not For Girls. 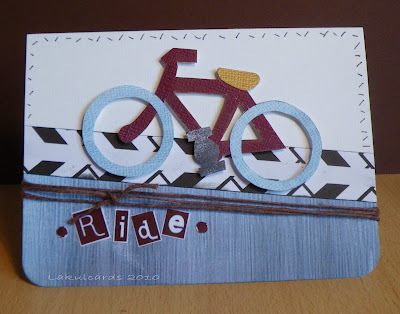 Ruth: A quick one from me this week - I've used this word card from Paper Boutique before and its such a nice card to make! I've hidden some dodgy cutting by using a black Sharpie marker around the edge of the letters! A bit of glitter glue on the stars and the card is completed! Dee: I've used papers from the All Around and Everywhere CD for my card. I've made it for my father-in-law so I wanted papers that had a slightly more classic feel about them. I love this combo of teal and brown, and the Chocolate Pearlidoodles look good enough to eat in real life mmmm! Tracy - My papers and image is from the Not For Girls CD-Rom, they have all been distressed with Distress inks, this is for my Dads birthday in 2 weeks time, he's a fisherman and this image was great to use, you can find it in the stampies section of the CD-Rom. Fliss: I've gone for a vintage style card made from the Sounds Good section of the Not For Girls CD as I just love the look of these papers which have a slightly grungy look. I resized the music background slightly to make a large card blank and printed out the jazz paper twice in different sizes. I cut out the smaller one and put on a dark red mat then decoupaged the jazz player from the larger one and stuck on with foam tape. 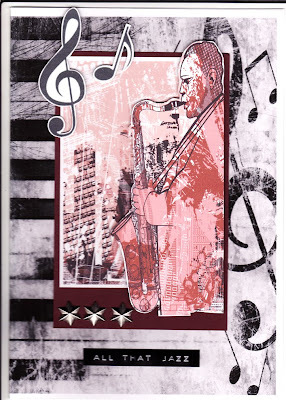 I finished off with some music notes, tarnished silver star brads and Dymo text to fit the jazz theme. Lisa: My background paper and cool little birdie are from the "Not for Girls" CD. I just fell in love with that cool little birdie sporting those shades! My Dad is definitely a cool bird and has been such a big help to me! Happy Father's Day to all those cool dads out there! We appreciate you on Father's Day and always! 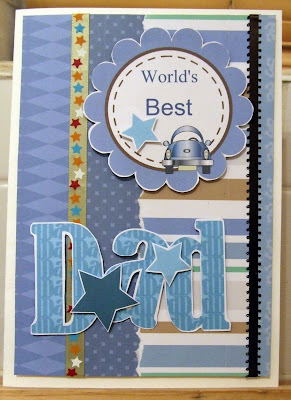 Nettie: Well this theme was ideal timing for me, Dad's birthday is just around the corner. It seems we are all loving these cool birdies from the Not for Girls CD. I have also used the stars and birthday papers from the same CD. This is a square easel card this week and I have just layered it up with different papers and not too many embellishments. Tracie This week I used 4 of the backing papers, and a customisable topper from the Vroom Vroom collection on Paper Boutique 1 as well as the Dad word and stars from the Wordbooks on the same CD. Kerry - I always make a card for my husband on Fathers Day and as we off on a cycling holiday this year, I made this the theme for my card. I used a bicycle template and cut out the pieces to make a rather rickety bike, used papers from the Not for Girls CD and some string. Good morning Polkadoodler's, it's Nettie here and I'm back with another challenge for all you lovely people. Thank you to all of you that took part in Lou's challenge, we saw some great creations and we enjoyed visiting your blog's. The Team have been really busy and let their imagination go with this one and produced some beautiful cards. Please let us know which Nursery Rhyme your using for your inspiration. Remember that your creation must not be entered into any more than 10 challenges, including the Polkadoodles challenge. Brenda - Mary Had a Little Lamb.......possibly overkill, but one of those where you just keep going. Beviboo stamp from the new Fairy Flutterfly collection, masked to create a bit of a scene, then decoupaged. 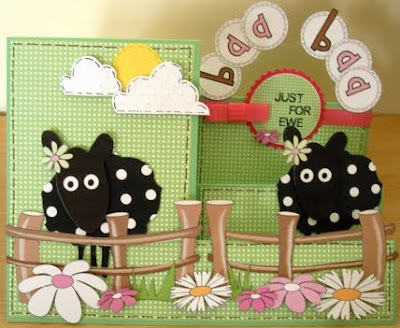 Background paper and sheep complete with woolly coat from Back to Nature CD and flowers (re-sized) from All Around CD. Kris: I missed last week's challenge and everyone had such wonderful creations but I'm back for this fun nursery rhyme theme. My rhyme is "The cat and the fiddle..." (sorry Nettie, I can't remember the words!). 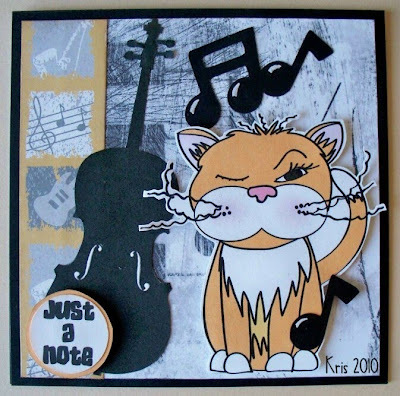 The backing paper, musical themed strip on the left and the fiddle are all from the Not for Girls CD and that cute little winking cat (Dylan is his name) is from the shaped collection on the All Around & Everywhere CD. I did add a few diecut notes and I computer-generated the sentiment. Tracy - Old Macdonald - I have used the All Around And Everywhere CD -Rom for my background, I also used it for the animals which I cut out and put on with foam pads, the fence is from the same CD and cut it out and put on with more foam pads. I used the Fairy Flutterfly stamps to stamp my flowers and added gems. The sentiments are from the Candy Doodles CD -Rom. The Nursery Rhyme title has been added using word art. Nettie: I loved making this one, it must be the animals!! I have gone with .....'Baa Baa Black Sheep'. I have used Maisie from the Back to Nature CD. I have turned the sheep into black polka dot sheep, he he. 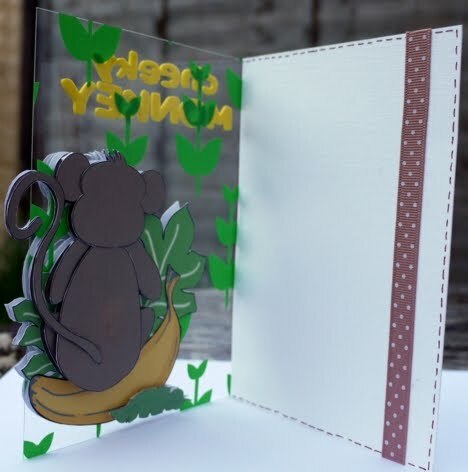 I have made another Step card and added some hand-made sunshine. Ruth: I've gone for Pat-a-Cake, Pat-a-Cake and I've been waiting for an excuse to use the divine cupcake from All Around and Everywhere! I printed it onto cream linen effect card and added plenty of glitter. I added one of the complementary backing papers behind the card as I decided not to make the card double sided. Lisa: This is my first card as an official Polkadoodle Design Team member and I had so much fun looking through all of the fun images! The nursery rhyme I based my card on was This Little Piggy Went To Market. The adorable piggy and background paper are from the All Around & Everywhere CD. 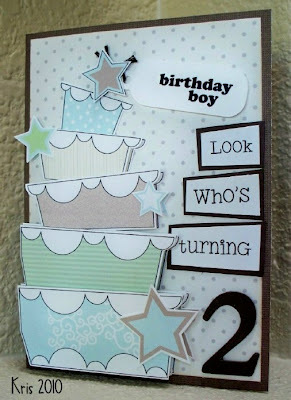 What a fun theme to base a card on... so many possibilities! Dee: I too have had trouble remembering any nursery rhymes, it was after all quite some time ago that they were read to me. In a flash of inspiration I did think of the Owl and the Pussycat so that's what I have gone with, complete with the pea green boat. The cat is from All Around and Everywhere and the owl and backing papers are from Paper Boutique. Jenny: I've gone for One, two, buckle my shoe as Polly Polkadoodle reminded me of a little girl waiting for help with her shoes! I changed her laces to a buckle by re-sizing a Candy Ribbon Slider to 30%. I also re-sized some Alphie Doodles for the sentiment. Everything is from the Candy Doodles CD except for the wall & grass which came from All Around & Everywhere and the butterfly which is part of the Meeshelle Fairy Flutterfly stamp set. Kerry - I chose Incy Wincy Spider and used papers from Not for Girls and the Halloween download. 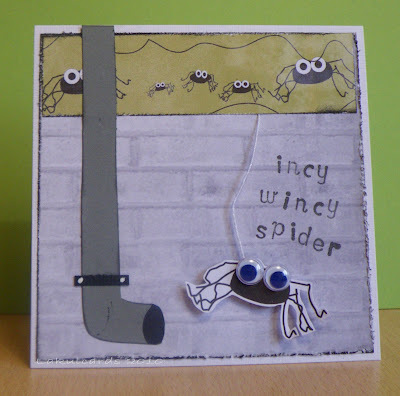 I distressed the edges of the paper, drew a very bad drainpipe for the spider to climb up!! and added goggly eyes. Fliss - I've gone for Mary, Mary Quite Contrary as my inspiration as my girls loved this one when they were little. 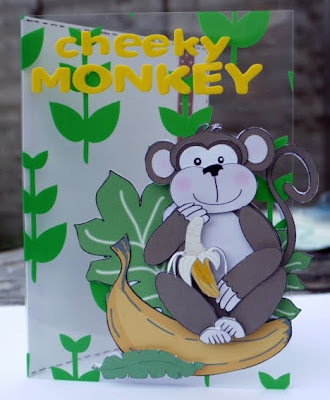 I've used Polly from Sugar Birdies as my image as I think she looks a bit naughty and have made a shaped card from Back to Nature. 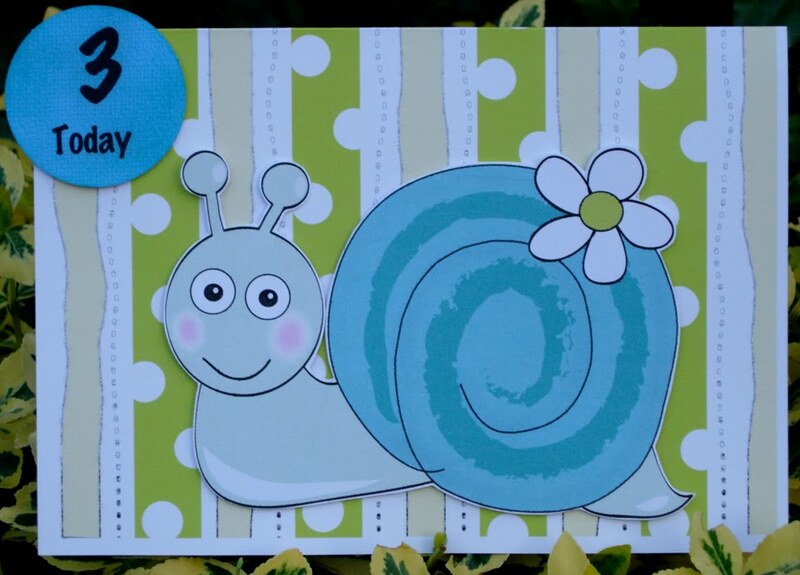 All the other embellishments come from All Around & Everywhere and have been layered up with foam tape to make a 3D card. Full details are on my blog. Please link your creation below and remember the terms of this week's challenge. The deadline for this challenge is Sunday 20th June at 12 noon GMT. Good luck. I'm just hijacking Lou's post to give you news about the Design Team call. I just want to say a big thankyou to everyone who responded to the call this time round, I'm sorry we can't respond personally to everyone but there are so many we would be sending emails for a week, but we do appreciate each and every entry and you are all doing some fabulous work out there. If you didn't get in please don't be downhearted, it really was a difficult task to choose and as always we can't have everyone even though we would if we could, so if you missed out this time please look out for the next call and have another go. So, we are really pleased to be able to announce our new teamies, the lovely . . . Welcome girls, we can't wait for you to join in and we know you're all going to be fabulous teamies! Once again, thanks so much to everyone who entered the call, we really loved looking at all your work and it was a hard task to choose, as always. Also, dont forget to tune into Create & Craft on 10th June for our next show! Right, back over to Lou! 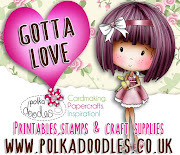 OK . . . many thanks to Nikky for announcing the newest Polka Doodles DT members and on behalf of the older (but not in age) DT, a huge big welcome to the new Polka Doodlers! Lou: I have used papers & toppers from the new "All around & Everywhere" CD and gone for quite a different feel. 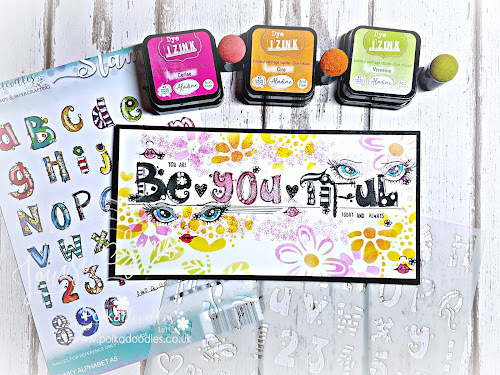 The sentiment is a mixture of Letraset rub-ons and stamping using several different alphabet sets. I also got out several different edging punches to make different layers. Brenda: Background paper from Love and Romance CD, flowers from All Around CD, spotty label re-sized and printed from the same CD, stamped sentiment and circle mat embossed with Cuttlebug roses folder. Kerry - Printed papers in pinks and browns from the Love and Cherish CD. Added some ribbon, some punched hearts and a stamped sentiment. Shame the photo is a bit washy, the colours are brighter in real life. Claire - Turtley in luv! Using bits from the newest CD All Around & Everywhere. The gorgeous mushroom stamp that is part of the Flutterfly Fairy set Maggie. Sakura pens, pressed flowers and sticky gems. Dee - Happy Anniversary Lou, I hope you have a fabulous day. 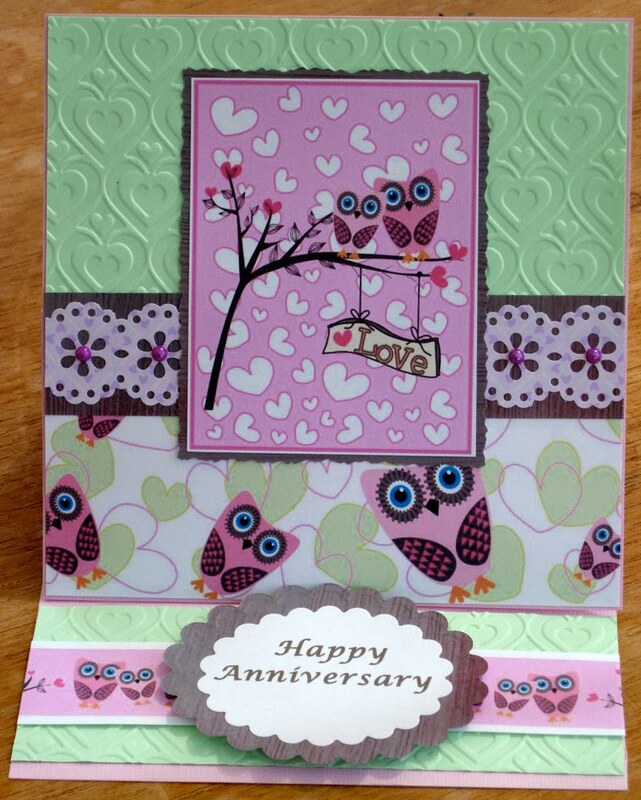 I've used papers from Sugar Birdies cd for my pop-up card. The only extras used were Copics/Promarkers, red heart brads and red gems. Nettie: I have gone with a very pink and simple feel for my card this week. 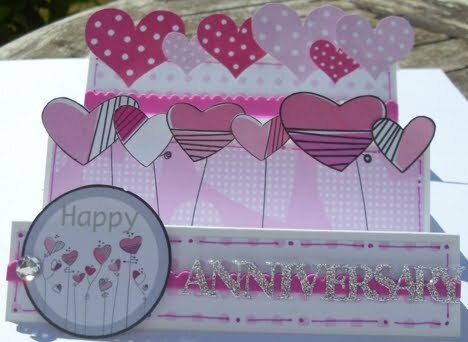 I have made a Stair Step Card using the funky hearts from the Love and Cherish CD. 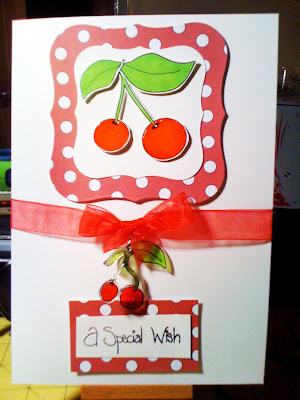 Tracie: This week I have used 50's dots and cherries motifs as inspiration for my simple card. Using the Sugar Birdies CD and shrink plastic. Fliss: I've gone pink and green witth a little chocolate brown for mine using mostly The Twoo of Us collection from the Love & Cherish CD with a small amount of paper from the Not For Girls CD as I needed some brown. I've made a central panel with one of the cute toppers and matted this on owl paper and Cuttlebug embossed green card. The bottom strip is from the topper sheet and I just added embellishment made with a Martha Stewart punch and scalloped oval Nestabilities. Ruth: Ran out of ink so had to improvise and made a gift box using stamps from Daisy Doodles and Christmas Doodles plus a tag from All Around And Everywhere. More details are on my blog! Stacey - Now I know we are not celebrating my anniversary but my hubby is a huge comic book fan so what better way to celebrate our anniversary than to make him his own super hero card!!! I used my newly aquired Not For Girls CD for this one. It doesn't get more retro for nerds than old skool comic books!!! Great challenge!!! More details and pics on my blog. 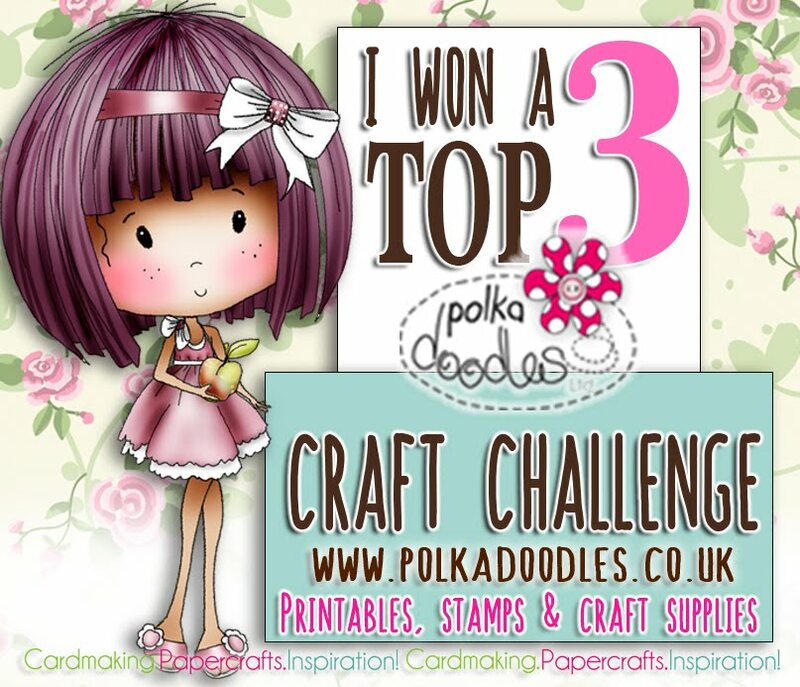 The deadline for the challenge is Sunday 13 June at 12noon GMT and please remember to link your creation below (please refresh your browser if the thumbnail does not show up straight away) and that you can enter your Polkadoodle creation into 9 other challenges.